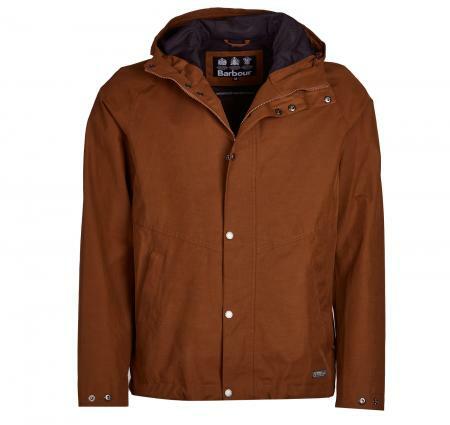 The Men's Barbour Charlie Waterproof Jacket is part of Barbour's Weather Comfort Collection and boasts a totally waterproof outer to keep you dry and protected all year round. Crafted from a cotton blend for a premium feel, the jacket boasts full zip fastening with storm guard, and an adjustable hood, giving you complete protection even in the heaviest of showers. The jacket also features a breathable mesh lining which wicks away the moisture to keep you cool, dry and looking your best. Designed completely with the wearer in mind, the Charlie features adjustable toggles to the hem and stud adjusters to the cuffs, allowing you to find that ideal fit and look. Two zipped welt pockets have also been added alongside an internal patch pocket, offering you plenty of space to store any essentials whilst out and about. The Barbour Weather Comfort Logo has been added to the hem, giving the jacket that final stamp of style and seal of quality. Whether heading out to walk the dog or exploring one of the UK's rural areas, the Men's Charlie Waterproof Jacket is the ideal companion to battling those pesky rain showers and staying dry and on trend season after season. Wash at 30 ° CSALE!